Notes: Norwich Castle is a medieval royal fortification in the city of Norwich, in the English county of Norfolk. It was founded in the aftermath of the Norman conquest of England when William the Conqueror (1066-1087) ordered its construction because he wished to have a fortified place in the important city of Norwich. It proved to be his only castle in East Anglia. It is one of the Norwich 12 heritage sites. The castle now houses the Norwich Castle Museum & Art Gallery, which holds significant objects from the region, especially archaeological finds. The castle remains a museum and art gallery today and still contains many of its first exhibits, as well as many more recent ones. Two galleries feature the museum's decorative art collections, including costume, textiles, jewellery, glass, ceramics and silverware, and a large display of ceramic teapots. Other gallery themes include Anglo Saxons (including the Harford Farm Brooch) and Vikings, Queen Boudica and the Iceni tribe, Ancient Egypt, and natural history. The fine art galleries include works from the 17th to 20th centuries, and include English watercolour paintings, Dutch landscapes and modern British paintings. The Castle also houses a good collection of the work of the Flemish artist Peter Tillemans. Two galleries feature changing exhibits of modern art, history and culture. 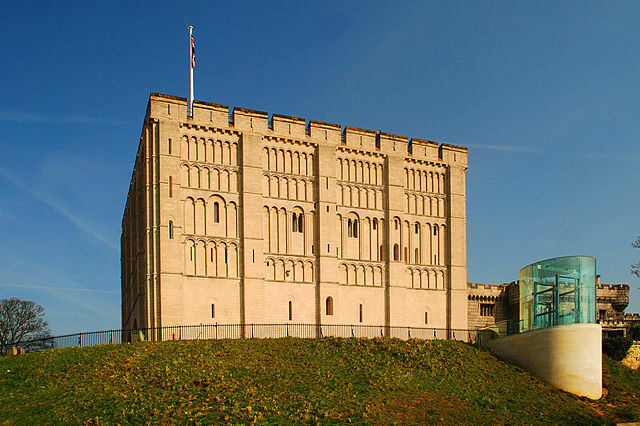 Norwich Castle is a Scheduled Ancient Monument and Grade I listed building. Visitors can tour the castle keep and learn about the castle through interactive displays. Separate tours are also available of the dungeon and the battlements. Although not permanently on display, one of the largest collections it holds is the butterfly collection of Margaret Fountaine. An unusual artefact is the needlework done by Lorina Bulwer at the turn of the twentieth century whilst she was confined in a workhouse. The work has featured on the BBC.